Homelessness charity Llamau has been presented with a cheque from housebuilder Bellway Wales, after staff took part in the organisation’s annual Sleep Out event. The Bellway team raised more than £3,800 after taking part in the charity event, which is held at Cardiff City Stadium each autumn. Nine Bellway Wales employees spent the night in the stadium, constructing a temporary shelter from cardboard boxes, and raised the money through sponsorship from friends, family and colleagues. The event is not designed to replicate the experiences of people who are homeless but instead aims to raise awareness of youth homelessness and raise vital funds for the charity. 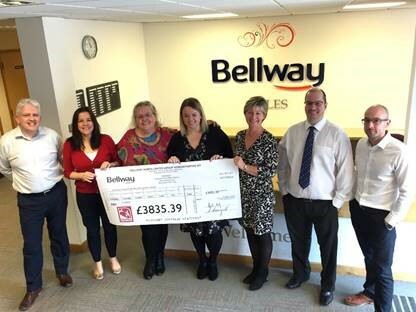 Some of those who took part were present to hand over the cheque to Llamau’s Income Generation Manager Wendy Collie, at Bellway Wales’ office in Cardiff on Monday, March 26. Simon Hughes, Development Manager for Bellway Wales, said: “It was great to invite Llamau in to our offices and formally hand over the result of our fundraising efforts. “We take part in Sleep Out each year to show our support for the fantastic work that Llamau does to help eradicate homelessness for young people and vulnerable women. Bellway’s Wales division is building homes in Newport, Cardiff and Swansea, as well as in Gloucestershire. For more information, see bellway.co.uk.